I thought I’d show you a little peek at the bathrooms we are about to renovate at the beach cottage. The master bathroom and the boy’s bathroom haven’t seen an update in I’d say 20 years. Can you see the age going on?? When we bought the cottage seven years ago, we knew that the bathrooms were needing some TLC but were not top of the list. We started renting our place out to “snowbirds” last year during the winter months in order to make some extra income for renovations. Yay!! It’s paying off! It took me a long time to decide to rent and open up my little baby cottage to strangers and entrusting them to love her as much as we do. I just realized that it made so much sense to let my fears go and rent out a couple months out of the year so we could be making money to do all the updates I have been dying to do! Oh hey there! Don’t mind me photo bombing. No way around that. Here we have the master bathroom. I mean how can I bear tearing out that baby blue stripe wall paper with the overlay border??? No tears here, I’m doing backflips rejoicing it’s going bye bye! Okay, so the picture quality is poor. I took these pics a few years ago before I had a better grasp on how to work my camera. I promise the “after” photos will be MUCH better! 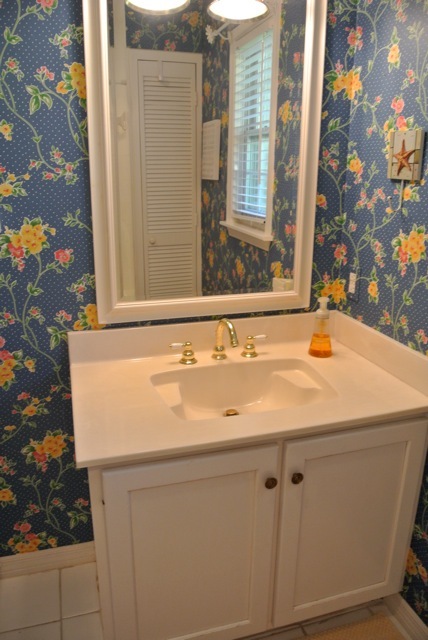 Can I just say that we bought this home from this sweet little grandma and she definitely has her design work all over this bathroom. Even down to the hand painted yellow check cabinet knobs. You can’t see them too closely, but she actually did a good job painting them. Remember the banner wall paper days?? Yes, wall paper is back with a bang, but border wall paper NOT so much. I actually tried to peel the paper off when we moved in and it was literally like pulling skin off the wall. Not a pretty site! So I’ve lived with this fabulous wall paper in all it’s shredded glory for years. I am really REALLY excited to see it gone! I actually liked having the white cabinets, because they are timeless but I’m pretty sure these are original 1960’s and the quality is just not there anymore. I’m redesigning the whole layout of this bathroom to be more functional and will no longer have this L shape double vanity. Again, big happy dance going on! The fixtures are brass, but not the brass that is screaming back in design today. I’m still deciding on whether I should put gold hardware back in. I’m loving the gold trend but it is expensive and let’s face it, this is my cottage. I need to get the biggest bang for my buck. I have a few hardware contenders and can’t wait to show you once I decide! And more golden brass…GONE BABY GONE! The toilet is getting moved to where the shower is. I’m super excited to expand the shower and to have a doorless shower entry. The whole bathroom is going to become bigger by knocking out a wall and moving a little into the master closet which is to the right of the shower. 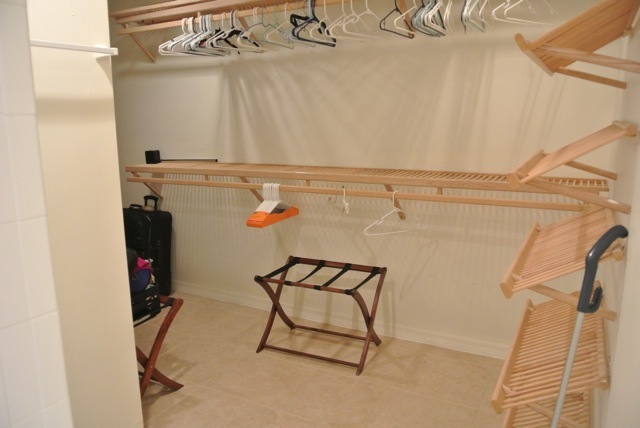 We really don’t need a closet quite so big and it works out well to use some of this waisted space for the bathroom. Since this is not our every day home, it’s not like I’m storing my whole wardrobe here. Just need a spot for the bikinis and sundresses because in the Florida heat, that’s all I can bear to wear. I can’t imagine big furry coats and scarfs here….EVER! 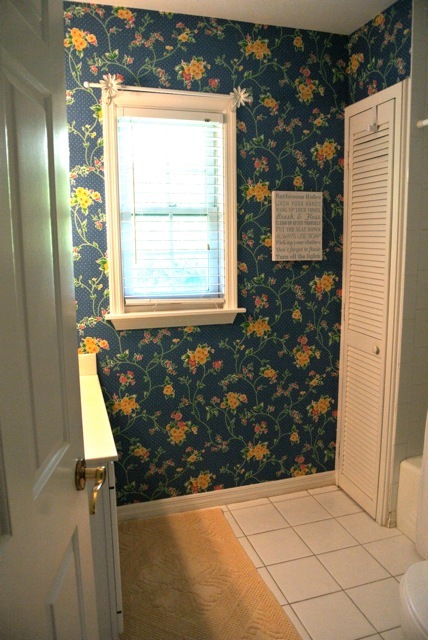 Moving on to the boy’s bathroom which also serves as the guest bathroom. This wall paper actually is coming back and I’ve seen very similar patterns for a whole lot of $$$$, but I’ve been staring at it for seven years and I’m ready to part. 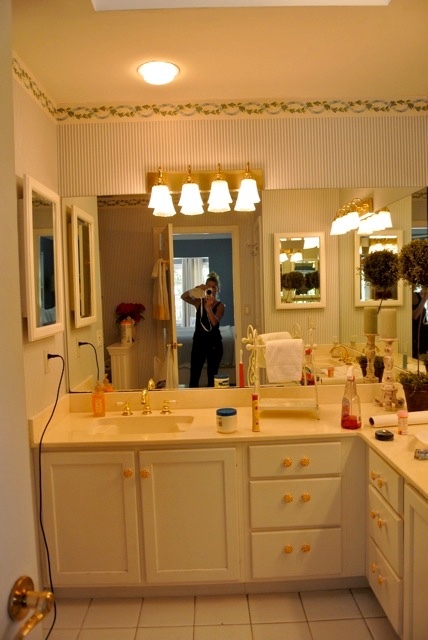 Plus it’s my boy’s bathroom! It’s not a big bathroom, so the renovation in here will be removing that linen closet you see in the mirror and extending the shower into that space. 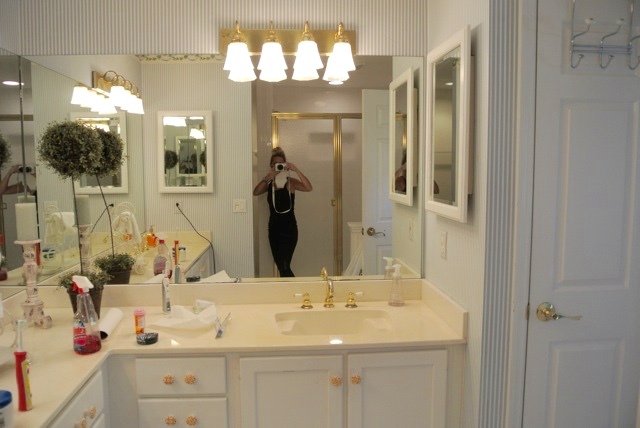 New tile on walls and floors, new vanity, lighting and hardware. So just some cosmetic work, but no tearing down walls. Renovation begins next week!! Can’t wait to show you the “After” photos!! Stay tuned! 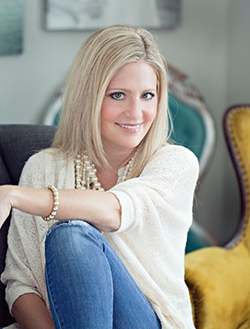 Shauna, you are an inspiration! 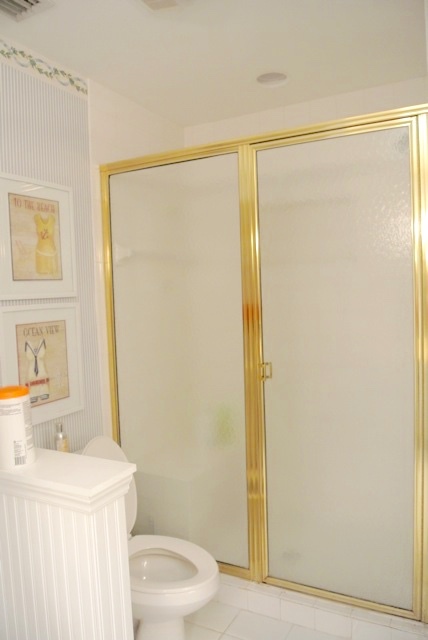 I think it’s really clever to use some of the extra closet space in your bathrooms to extend the size of your bathrooms. I’m excited to see how the guest bathroom looks once you’ve moved the shower into the space that used to be the linen closet. I bet that the room will really open up! I’m so excited to see the pictures of the finished renovations. Thank you! I’m keeping my fingers crossed that the bathrooms turn out how I planned!